This application helps developers to generate Flex code to consume BlazeDS/LCDS Remoting services and also generate configuration file to expose Java classes as Remoting services. Developers can view response from a Remoting service, generate Flex code to invoke a Remoting service and also generate AS3 VO code for the Java classes. Content in this page was earlier hosted at https://sujitreddyg.wordpress.com/2009/05/07/blazemonster/ You can find more comments there. What can this application do? 2) Invoke them and view the response in the application. 3) Generate Flex code to invoke a operation on a destination. Complete code including required AS3 VO classes will be generated. 3) Generate Flex code to invoke methods on the Java class exposed as Remoting destination. Complete code including required AS3 VO classes and configuration files will be generated. Spring BlazeDS instantiates MessageBroker with “_messageBroker” as ID and so you need to modify invokeremotingservicebrowser.jsp to get destinations from MessageBroker used by Spring BlazeDS. This can be applied to any case where the MessageBroker has a different ID than the default. The tool is nice, but how to login(authenticate) in case of using the java-security for spring-blazeds? In my case, my methods and arguments were not exposed to the destinations. Do you have any idea, how to get them exposed to your tool..? The id of Bean required to be in this way to get the list of methods available.. I was introspecting one of my services which returned a VO. When I tried to invoke that service, the tool told me to generate VOs and I am able to do that from the other link inside the tool. Is there a way I can make that newly created VO available for the tool so that it can now invoke my method. Also can it be added to the list of operationarguments in the RemoteBlazeDS >> Add Argument Screen? I read the message carefully and it appears that you did add the capability to add dynamically created VOs, not that I know that it is possible to with Flex. Additionally another nice to have feature is to use dynamic objects for Custom VOs in the absence of specific ones. Is there a license associated with this project? 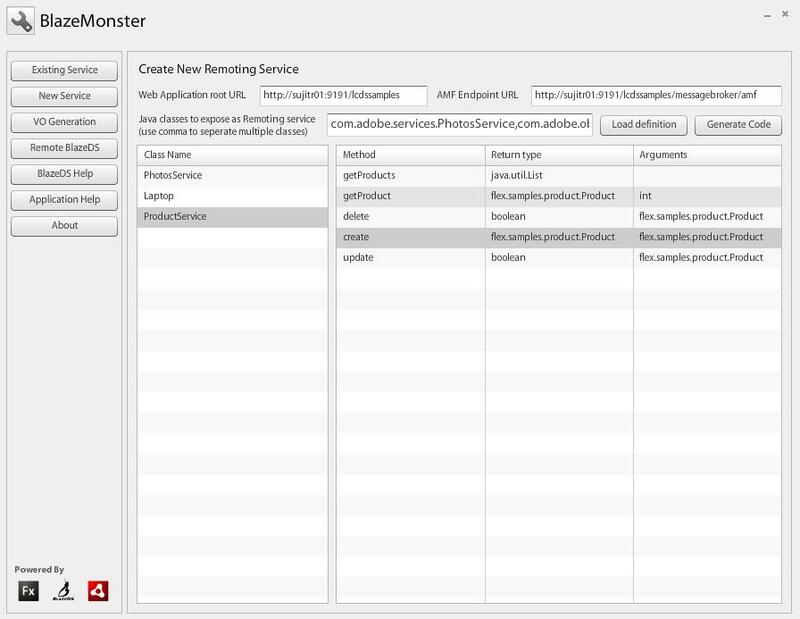 BlazeMonster will be a great tool, it looks like theres a couple of small bugs. When generating multiple VOs, the generator seems to be aggregating the properties. Each VO gets its properties and all of the properties from the VOs before it. An ArrayCollection import isn’t being added when ArrayCollection is used and there doesn’t seem to be a way to close generated VO tabs when you’re dome with them. 1. java.util collections are not mapped to ArrayCollection in AS3. (If a Java model object has a Set then the AS3 has a Set, where it should have an ArrayCollection). Also, add the import mx.collections.ArrayCollection and mx.collections.IListView. 2. All the fields of the AS3 VO are public but if you could have them be private and then have get/set fields that would be cool. (Maybe that could be an option in the Generate VO action). Excellent Tool, Thanks to Sujith! First of all, I love this tool. This should be shipped with every distribution of BlazeDS. Second of all, any chance of releasing the source? I have a few customizations I’d like to make. 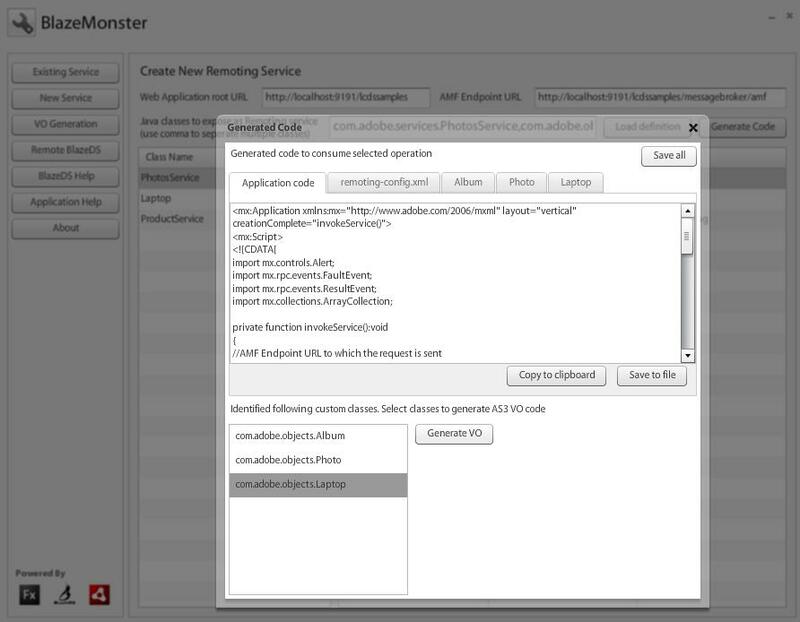 However, if I use BlazeMonster, the “Server Response in Tree” and “Server Response in Text” are all completely empty and no error is displayed. It just doesn’t work. 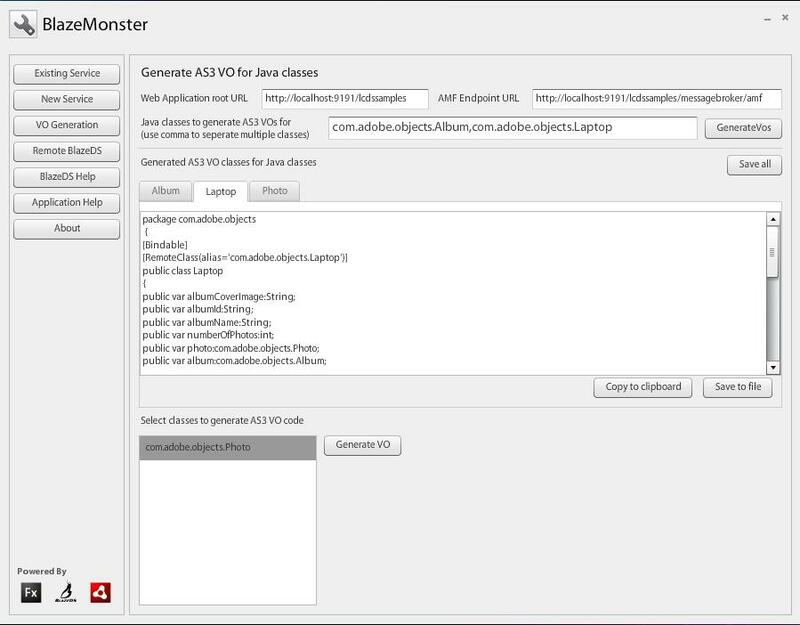 Can BlazeMonster generate AS3 Value Object/Data Transfer Object from complex Java classes without issue, like enum, generic, collection/set/list/map than contain other collection/set/list/map (few levels)? Looks like the server and application context entered are wrong. Can you please make sure values are right. Honestly I just downloaded this but already it reminds me of the amfphp service browser and I feel right at home with it. I don’t know if other service browsers for JAVA exist out there but coming from AS3 and MXML this is a lifesaver on a guy who’s a little rusty with JAVA! Thank you, thank you, thank you.